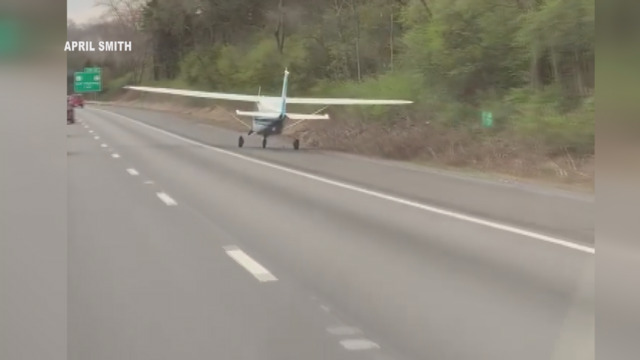 WASHINGTON COUNTY, Va. (WJHL) - A small airplane has been removed from the interstate after the pilot made an emergency landing because the aircraft ran out of fuel. The plane landed around 6 p.m. Friday on Interstate 81 north near exit 7 in Virginia. No one was hurt and no vehicles were struck, according to Virginia State Police. According to the FAA database, the plane is a Cessna 172B registered to David B. Hobart of Virginia Beach. VSP originally said the aircraft would be refueled so the pilot could take off using the interstate as a runway. 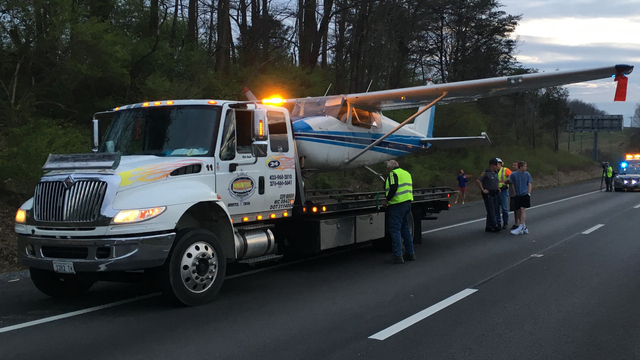 Instead, the plane was loaded onto a tow truck and removed from the scene around 8 p.m. VSP said it would be taken to Virginia Highlands Airport. The pilot told News Channel 11 he just purchased the aircraft and that was his first time flying it as owner. 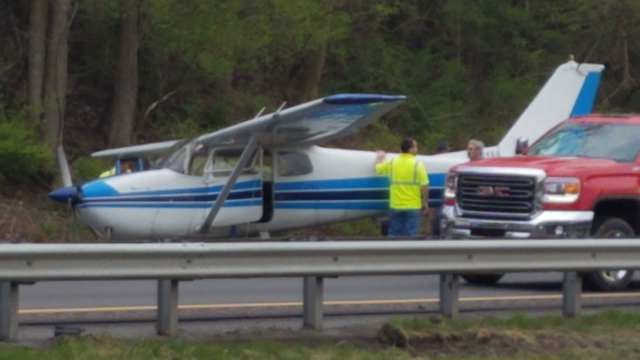 One lane of I-81 was closed while the plane remained parked on the shoulder of the interstate. 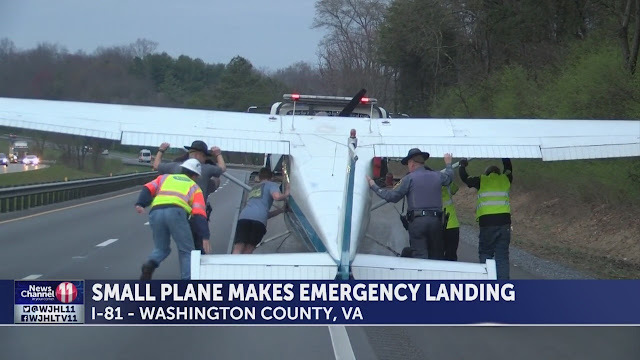 Washington County, Virginia — At 6:01 p.m. Friday, Virginia State Police received a call of a plane having to make an emergency landing on I-81 around mile marker eight. Police say it was a small fixed wing aircraft near the Exit Seven area in Washington County. The plane had to make an emergency landing because it had run out of fuel before it could reach the Virginia Highlands Airport in Abingdon. "He recently purchased [the plane] this morning" said Virginia State Master Trooper Patrick Lower. "Its got a faulty gas gauge." "There's no coordinated emergency landings. It just happens. He didn't call ahead to ask to land on the interstate. He did a great job not hitting anybody or anything." The aircraft was re-fueled and taken on a flatbed tow truck to Virginia Highlands Airport. 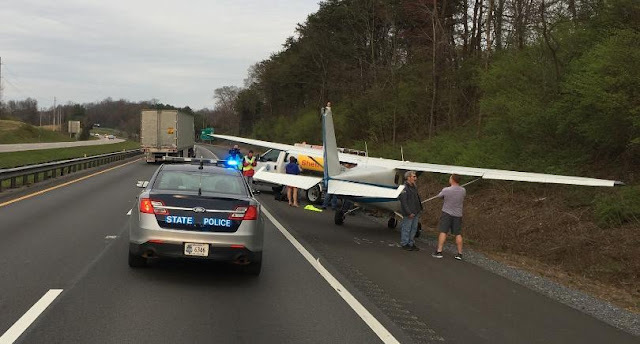 WASHINGTON COUNTY, Virginia (WDBJ7) — Virginia State Police responded to an unusual event on Friday after a plane was forced to land on Interstate 81 in Washington County. 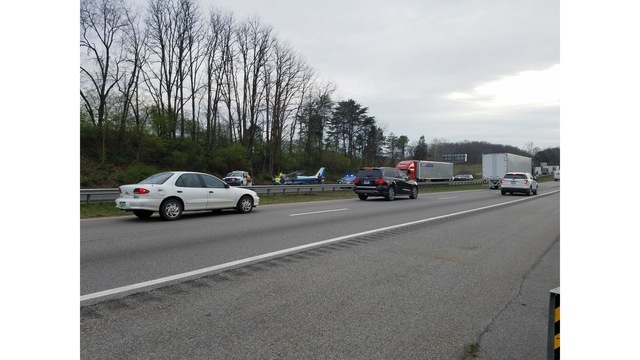 At 6:01 p.m. Friday, state police received a report that a small, fixed-wing aircraft made an emergency landing off the right, northbound side of I-81 near Exit 7 in Bristol. The plane made the emergency landing because it had run out of fuel before it could reach the Virginia Highlands Airport in Abingdon. The pilot was not injured. No vehicles on the interstate were struck or damaged, according to a release from VSP. 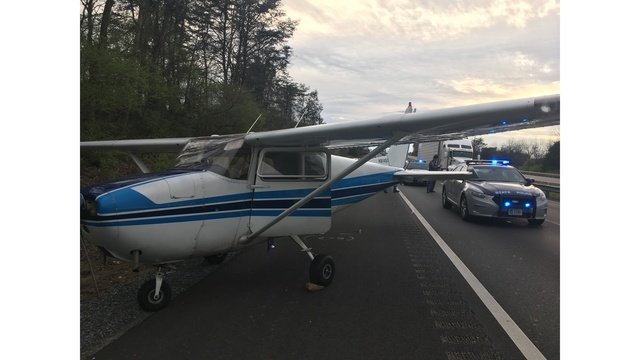 The aircraft was refueled and the pilot had to wait for approval by the FAA to take off, police said, but then he took off from the interstate and continued along his route safely.